In 2002 my twelve-year-old daughter took it upon herself to send a letter to Country Magazine. 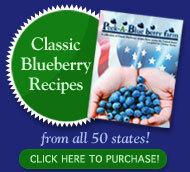 Her request: she wanted a blueberry recipe from every state to add to her collection. 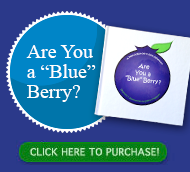 We had started a blueberry farm in the country hills of Steuben County, New York State in 1999. Chelsey was notified in August that she was selected to have her request published in the December/January 2003 edition. She was also warned that she might get a lot of mail, and to be prepared. The magazine was released for circulation and the letters started rolling in, ten or fifteen a day, and then twenty five to fifty a day, and finally around seventy five to eighty per day. Readers from every one of the United States and three countries opened up their recipe boxes, hearts, and ideas to share their favorite ways of using blueberries. Overwhelmed with mail and cookbooks, gifts and cards, the process was becoming so much fun. Our family, friends and neighbors would call to see how many letters Chelsey would get each day. Even the mailman started leaving special mail bundles, inquiring how many recipes she was up to. After an estimated 2,500 recipes and over 1,000 letters, we soon learned that people are very generous and that they love blueberries. We also learned that there is a real desire for people to bond to a common something given the chance, and in this case, it was blueberries and a twelve-year-old girl. With this wonderful response, Country Extra Magazine in the May 2004 edition featured “How She Was Helped” as a follow up to the huge response from people all across America, and even three foreign countries. Explaining her desire to create a cookbook with her blueberry recipes received, more letters continued to follow and even now in May 2006, occasionally a letter or two still comes her way. Letters and recipes signed Grama, your friend, Chef, school teacher, retired, Blueberry Association; all shared their fondest memory of “blueberry days” or ‘blueberry recipes” (usually intertwined together). Chelsey has been blessed to be a part of many lives that have the common bond of blueberries. Prior to our three-acre blueberry farm, for over 15 years we had a few plants in our side yard. Around mid July, blueberries became the coveted food group. So much that our dog Chance would eat them right off the bush and our two cats, Thomasina and Chloe, assisted in the “supervision” of the picking, making them also a part of the picking ritual. Starting off, we had dug over 1,000 holes and hand planted every plant. Our plants were ordered out of Arkansas after finding them on the Internet. They arrived on Easter Sunday in 1999, and we had to give the venture a name. We agreed on Peek-A-Blueberry Farm and it seemed appropriate. Our farm overlooks a beautiful five-acre pond, and is nestled among Chelsey’s Grandparents’ family dairy farm. Now with over 2,200 plants, family, friends and neighbors enjoy the large blueberries. We also supply a local grocery store chain, Wegmans of Corning, New York with the in-season “home grown” Peek-A-Blue berries. This cookbook, with now over 1,800 copies sold world wide, that my daughter typed on her own during the summer of her fourteenth year, has been shared with families, friends, and blueberry lovers from all over the world. Because of the overwhelming support of thousands of letters and the support of the Wegmans Food Stores promoting this book, Chelsey has chosen the food industry for her career path, and has graduated from Cornell University in 2012 in Ag Science / Food Science, and Purdue University in 2014, with a MS in Food Science. She is now working in the Food Industry in Minneapolis, MN. Thank you to all who have sent a favorite recipe, notes of encouragement, gifts, or just well wishes. We received so many duplicate recipes and due to allotment of space, every state is represented with many unique recipes, but not all recipes were able to be included. Bring a part of America home to your kitchen.